There’s no doubt that this month’s shootings in Tuscon came as a shock to all and an unwelcome start to the new year. The January 8th shootings left six innocent people dead and congresswoman Gabrielle Giffords fighting for her life. Meanwhile, lone gunman Jared Loughner awaits trial for his part in the unprovoked massacre. It’s a grim scene indeed, but as the days progress and more effort is made to learn about Loughner and his motives, more things come to light that showcase the gunman’s steady climb toward his breaking point. The latest news to come from Arizona is regarding Loughner’s tattoos. According to artists at Tuscon’s Sacred Art Tattoo, Jared Loughner came in for a tattoo of a 9mm bullet back in October of 2010. 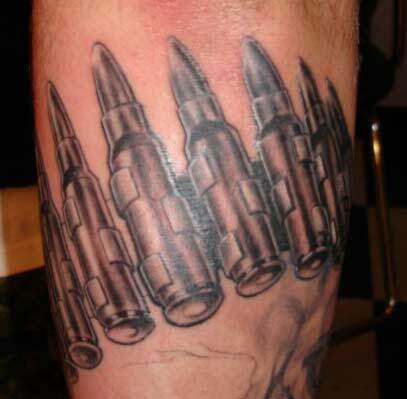 Sometime later, Loughner returned for a second tattoo of yet another 9mm bullet. The artists at Sacred Art remember Loughner to be a very strange and awkward young man. ‘”When Jared first came in he was a little bit shy, a little bit timid, it was his first tattoo,” Brittney Ramirez remembered. Immediately, Ramirez says she got a weird vibe from the accused gunman. The artists asked him why. Obviously the tattooists at Sacred Art had no way of knowing who Loughner would turn out to be or what he would end up doing, but the very idea that these people caught a strange vibe from him is just plain haunting. It’s very easy now to look back at all this and see how fitting it was for Loughner to choose a tattoo such as 9mm bullets, but when all is said and done, gun related tattoos are certainly nothing new or anything out of the ordinary. ‘Lenny Mental, owner of Sacred Art, says the request for a bullet tattoo isn’t out of the ordinary.